This article originally appeared on Brinc, click here to check out more awesome blog posts from them! Antoine Markarian is CEO and co-founder of Kello, a smart alarm clock launching in September that will make mornings magic with better sleep. Hailing originally from Paris, he and his team of co-founders (Greg Markarian and Fred Germain) are working tirelessly to fix sleep and change the way we think about waking up in the mornings and go to bed in the evenings. In this post he shares how small changes in behavior can help us sleep better at night, improve our overall health, and optimize productivity during the day. 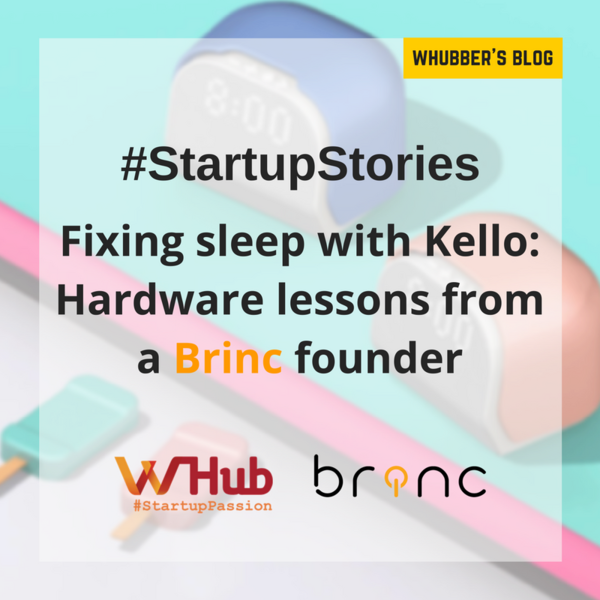 He also gives insights on the challenges and opportunities of being a hardware entrepreneur based in Asia and what it’s like to be a French startup in Hong Kong. What is the vision for Kello? We’re trying to fix sleep. Sleep has become a real issue nowadays for people due to our 24/7 lifestyles. It’s hard to get enough of it and no longer just an annoyance as it’s now been labeled as a disorder. In fact, according to the Institute of Medicine, there are 70 million Americans who are diagnosed with sleep and wakefulness disorder. Then there’s 40% of people who reported unintentionally falling asleep during the day in the past month. This means that nearly 1 out of every 2 people fall asleep during the day. Can you imagine if this person is in a meeting or worse, driving a car or operating machinery? It’s a lifestyle issue. It’s not about cramming more sensors on your bed, it’s about changing your lifestyle to get a good night of sleep and feel refreshed in the morning. This is why at Kello we are setting out to fix sleep by applying scientific research that’s been done on the body clock. By helping people form good body habits, we can optimize sleeping and waking times to help users feel energized as they transition from night to day. 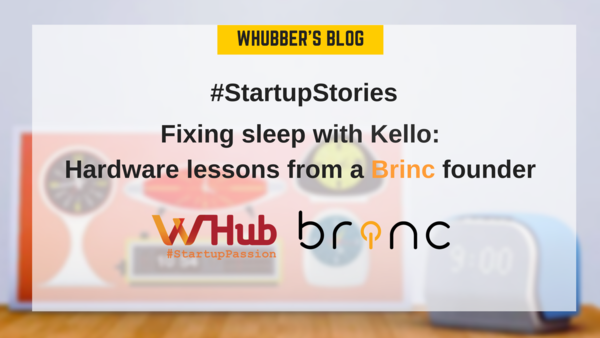 Why does the world need a smart alarm clock and how did this lead to Kello? I love music and used to work in the music streaming business. I had thought about leaving corporate life and was toying with the idea of a new kind of connected music device: the alarm clock. I brainstormed the idea for a while with Fred who had a background in embedded systems and with my brother Greg, a mechanical engineer, who absolutely loved the idea as he hated waking up as much or even more than I did. We started testing our idea, interviewing potential customers, pitching at events and quickly realized connecting the alarm clock to music streaming wasn’t enough. The device didn’t exist but it wasn’t very differentiating and could easily be replicated. Around the same time, my wife and I went on our honeymoon. There wasn’t much to do on the island so we’d go to bed early and wake up early to squeeze in as many activities during daylight. My wife was surprised as I had previously hated mornings yet during vacation I turned into a virtual morning person. On holiday I was getting 8 hours of sleep but didn’t realize how big of a difference it made on how I felt and operated until I started looking more closely into my lifestyle when we returned home. I wasn’t getting nearly enough sleep due to keeping irregular bedtimes from bad habits I had formed from previously being an engineer. I was also constantly caffeinated from drinking too much soda. Being a bad sleeper also affected my energy levels at work and when I was with family and friends. It was definitely a turning point for me as I had looked forward to waking up during my vacation. I wanted to have that feeling every day for the rest of my life and knew it was time to fix my lifestyle. Fred, Greg and I brainstormed more and knew we were onto something. We did more research, interviewed experts and realized that with a bit of help that we could actually fix sleep! Kello would be much more than an alarm clock. It would be a sleep trainer that prepares you for the day ahead. We’re now testing our prototype on a daily basis. I’m excited and look forward to mornings when I know I have my awesome playlist to wake up to. Changing your lifestyle to optimize sleep makes life so much easier when you’re not groggy or cranky. I’ve never experienced this feeling before as it’s an entirely new habit. Bottomline, it’s good to wake up in the morning when you don’t have to struggle to get a full night’s worth of sleep. Life is good. Who is Kello for? How did you decide on the feature set for your users? There are people who think they’re trying to earn more time by being more productive and sleeping less. What they don’t actually realize is that the time you lose sleeping translates to lost time during the day due to lower productivity levels. It’s just not worth it to shorten your nights to do more because you’ll actually end up doing less. Even night owls need enough sleep. What is also common are people who brag that they only need 4 hours of sleep. What we’ve found is that this is a genetic trait and that it’s scientifically proven that there is only 1% of the population who has this gene. If you sleep 6 instead of 7 hours per night for a few, your ability to learn and make proper judgment becomes impaired. What we know is when CEOs and politicians are making decisions when not fully rested, it’s the equivalent of having alcohol in your bloodstream and being a bit drunk. Kello is for anyone who has ever been sleep-deprived and wants to do something about it. We designed a device that changes behavior and habits. When we talk about getting enough sleep, it comes down to lifestyle and making adjustments in how we get to sleep and how we wake up. Studies suggest that you stop looking at screens 30 minutes before you go to bed to help with getting a good night’s rest. We’ve designed a device that acts as a personal sleep trainer and enables you to get the phone out of the bedroom. It also reminds you that you need to go to sleep because we know that developing good habits in your evening routine is just as important as how you wake up. Our goal is for it to take you by the hand to get enough sleep without the usual distractions on your phone. By keeping the phone out of the bedroom, we’ve designed a bedside companion to help avoid distraction and temptation to browse Facebook, play Candy Crush, or check email. Once you program Kello initially, you no longer need the phone and can use the buttons on the device and use the visual cues on its display. You can wake up to the music or content that you want (e.g., Spotify, TuneIn, Soundcloud, etc.) without your phone and without having to stare at a screen. There’s also growing amounts of scientific research that says breathing exercises can get you in the best mindset for sleep so we included a breathing technique feature to help train users fall asleep faster. Now with Apple also launching a breathing app as part of its Apple Watch OS, it’s clear that we’ve stumbled on to something. You’ve made a lot of lifestyle changes since starting Kello, including moving to Hong Kong. What kind of advice would you give to other founders in Europe who are thinking about taking the leap and moving to Asia? Two reasons: time and money. 1) Time: For the first PCB board produced in China, we asked the factory to fix and by end of day, we had 10 boards that were ready to bring back to Hong Kong. If we were in Paris, it would have taken so much longer to send samples back and forth and to pinpoint issues to the factory. The whole process would have taken 10 weeks instead 3 weeks. And 7 weeks is huge in the life of a startup. Saving time, means saving money, period. Ask any hardware founder and they will tell you the same. 2) Money: When we were looking into the last iteration of the Kello prototype to have it CNC’d, we asked for a quote in France, it cost 10 times more and would take 3 times longer to make in France compared to China. In France there are misconceptions about quality in China but we’ve been very impressed with the quality of work and level of commitment from the people that we’ve been working with. It’s just not something that I was expecting in China given what I had heard. Chinese vendors are very predictable in their behavior and are always working which is great when you’re a startup! I can chat with a PCB vendor on Friday at 9pm on Skype and visit a factory on a Saturday afternoon. There’s also talk about the Chinese being copycats but what we’ve seen is that there’s a lot of knowledge in China that you won’t find elsewhere, like building LCD screens. The only people who know how to do this are in China and it’s been amazing to be able to work directly with them on a consistent basis given that we’re based here. What have been the opportunities and challenges of building your startup here in Hong Kong? We’ve managed to assemble a lean, global team across multiple time zones and it’s worked really well for us. It can be challenging as a startup to source software talent anywhere in the world and it’s no different in China and HK. We’ve since hired a vendor in France and I think we have best of both worlds. He’s fast, there’s no bugs and sticks to design guidelines. We’ve also hired a French design studio that designed furniture sold in a lot of design stores worldwide. We have noticed that sometimes Hong Kong is not the most entrepreneur friendly place yet there’s definitely a growing entrepreneur community here consisting mostly of expats. Perhaps there are 2 groups, one local and one expat but we don’t speak Chinese. Sometimes we miss the camaraderie of more entrepreneurs to share the pain with but the benefits of being in Hong Kong and proximity to PRD far outweigh the challenges. It’s also great to be working out of Brinc and have access to other hardware founders and partners who may or may not be based in Hong Kong. What are the benefits of being in Hong Kong versus being in Shenzhen? I’ve thought a lot about being in Hong Kong or Shenzhen and have asked that of other hardware entrepreneurs. Based on what I’ve heard and witnessed you can lose a lot of productivity in China if you don’t speak Chinese you can’t use Baidu and all of the other things that are accessible to the Chinese – and then you also can’t use the Western stuff that you can’t live without, like internet. On the R&D side it’s probably more efficient to be in Shenzhen but it doesn’t make sense to stay there when there are so many things not R&D related such as digital marketing where we’re running Facebook ads and pushing out content. End of the day, Hong Kong is the best place to be for us at this stage given the benefits of being here with the proximity to PRD. In our opinion the city offers a better quality of life that we’re used to living and where we can be more efficient during the day with the ease of communication and internet standards that we’re used to out in the West. We fully realize that Hong Kong is a lifestyle choice and better place to be living in than Shenzhen. It can be an expensive city for young entrepreneurs but there’s definitely ways around it. All things considered, we wouldn’t have been able to move as quickly and be where we are now with going out early with a good prototype. By being based here, we’ve saved time that we would have wasted sending samples back and forth by ultimately manufacturing a better quality product and building in more differentiation. We’ve met other founders who did try to skip steps and move quickly by going in and out of China and know that we’re ultimately in a better place.